After an anti-fracking protest led to an arrest at a K & H injection well site in 2014, activists in Athens, Ohio have since been on a mission to prove that injection wells cause groundwater contamination to aquifers, despite the fact that there has not been one single case of groundwater contamination in Ohio from injection wells. Today, we learned that new testing for volatile organic compounds in Ohio private water wells located near the K & H injection wells in Athens, Ohio showed no signs of oil and gas influence, according to reports from the Ohio University Voinovich School. The news comes after Athens County Commissionersannounced joint partnerships last month with Ohio University to conduct a study to undertake the impact from injection wells on private water wells. Testing was conducted this fall and will be repeated in March. This shouldn’t be surprise, considering Ohio’s regulations are in fact more stringent that the federal government’s own standards. Despite the result of the U.S. EPA audit, last month the Athens County contracted Ohio University to conduct a study that cost more than $15,000, which included baseline water testing for 10 testing sites, for a total of 20 total samples. The baseline testing would update water samples from 2013 to “detect any changes or trend in the water quality”. The groundwater well samples were taken within a 2-mile radius of the K & H Torch-area injection well sites. The sampling taken at the injection well sites produced results that showed no oil and gas influence to the groundwater. The groundwater samples in Athens are yet another example of the many reports and studies that continue to uphold the vast federal and state regulations that are in place to protect the health and safety of our aquifers. 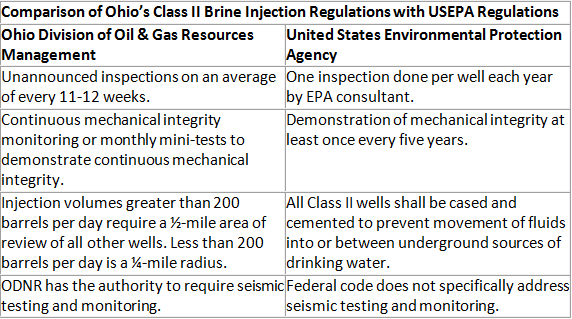 This news supports that injection wells are safe, regulated, and an essential component to Ohio’s oil and gas industry, which provides thousands of jobs, millions in tax revenues, and has supported over $33 billion in investment to the state.